You are here: Home / Archives for Jalman Precision Co. Ltd.
[INQ. NO. 1412M14] Jalman Precision’s rod ends are mainly used in the construction of control rod linkages, based on tensile and compressive loads transmitted through the control rods. These types are self-aligning bearings designed to take both radial and thrust loads and to have a superior performance especially in rotational and oscillating motions. They are essential components to design machinery and improve their performance in various industrial fields. 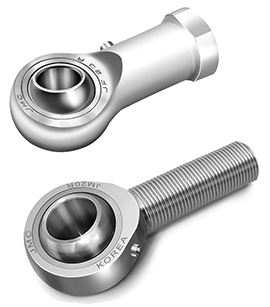 JF20~JF80 and JM30~JM80 are much bigger size than other rod end bearings and specially manufactured considering heavy loads and tilting angle. So, these four items were made of steel on steel structure instead of steel on composite material. JMC spherical plains GE20FO-2RS~GE80FO-2RS are inserted by press for heavy duty applications. Jalman Precision is itself equipped with such arrangements as upgraded globally competitive facilities and know-how, to fully meet the demanding requirements arising among the valued clients of global markets. [INQ. NO. 1412M13] Jalman Precision is a professional manufacturer of state-ofthe-art products such as rod ends, spherical plains, balljoints & track roller bearings by using independently developed technology, further proceeding to produce rare kinds of bearings with globally competitiveness comprising price, quality, design, durability, etc. Jalman Precision’s JMC stud type track roller is proper for static loads and heavy loads at low and middle high speed. In view of its multiple functions, there are various usages in accordance with diverse kinds of rollers such as guide rollers, rocker valve rollers, cam rollers for slide and pressure rollers. JMC stud type track rollers are suitable for many kinds of machines like automatic machinery, specialized machinery, cam-working assembly, various carrying facilities, conveyors or the tool exchanger for machining center. Generally, JMC stud type track rollers are non-separable bearings and do not need additional lubrication for a long time if the initial grease fill is sufficient. 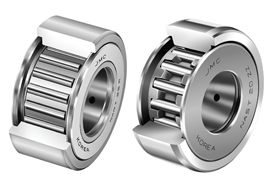 JMC stud-type track rollers with a cage have sufficient space to store the lubricant. So these types are suitable for high speeds and low loads. Otherwise, stud type track rollers without a cage which is fully stuffed with needle rollers are non-separable bearings suitable for low speeds and high loads. They should be relubricated regularly. Jalman Precision’s Rod ends are mainly used in the construction of control rod linkages, based on tensile and compressive loads transmitted through the control rods. 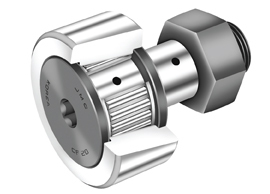 These types are self-aligning bearings designed to take both radial and thrust loads and to have a superior performance especially in rotational and oscillating motions. They are essential components to design machinery and improve their performance in various industrial fields. JMC Yoke type track rollers are suitable for handling high loads. They are applied as guide rollers, rocker valve rollers, eccentric rollers, table support rollers. 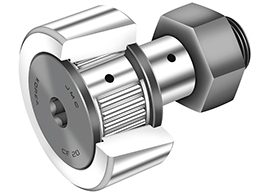 They also can be used for many other applications involving either linear movement or the translation of rotary motion to axial motion and they are also readily available, easily mounted and low-price bearings. There are two kinds in a series of NART which is a non-separable type, one has a retainer (or cage) to make needles rotate freely at high speed and the other is just stuffed with needles so as to endure heavy loads at relatively low speed. The range of bore diameter is from 5mm to 50mm and NART..R, which has a crowned outer ring like the company’s regular products. Yoke type track rollers of series NAST are newly developed to satisfy our customer’s increasing requirements. This type is one of our standards and consists of an inner and an outer ring, retaining washer and a precision cage. Type NAST characterizes not to have thrust washers fixed with inner ring. NAST..ZZ which has two retaining washers on both sides is a little different from NART. The thrust washers of series NART are pressed into the inner ring, thus making the rollers inseparable. In series NAST, the retaining washers are loose and the rollers are separable. NAST are all separable types. There is another type, RNAST which has no inner ring. This type runs directly on the shafts or in the housings. Jalman Precision is professionally conducting a manufacturing of state-of-the-art products such as rod ends, spherical plains, ball joints & track roller bearings by using independently-developed technology, further proceeding to produce rare kinds of bearings with globally competitiveness comprising price, quality, design, durability, etc. Among the bearings above, Jalman Precision’s JMC stud type track roller is proper for static loads and heavy loads at low and middle high speed. In the view of it’s function, there are various usages in accordance with those kinds of rollers such as guide rollers, rocker valve rollers, cam rollers for slide and pressure rollers. JMC stud type track rollers are suitable for many kinds of machines like automatic machinery, specialized machinery, cam-working assembly, various carrying facilities, conveyors or the tool exchanger for machining center. Generally, JMC stud type track rollers are non-separable bearings and do not need additional lubrications for a long time if the initial grease fill is sufficient. JMC stud type track rollers with a cage have sufficient space to store the lubricant. So these types are suitable for high speeds and low loads. Otherwise, stud type track rollers without a cage which is fully stuffed with needle rollers are non-separable bearings suitable for low speeds and high loads. They should be relubricated regularly.